Demand for battery metals is expected to increase even further as a network of charging stations for electric vehicles is built out. “Declining ore grades for copper, continued lack of investment in new mines and the time required to bring new discoveries to production will constrain metal availability and, ultimately, the metal sector's ability to meet growing demand from automakers for battery electric vehicle production,” Carol Cowan, a Moody's Senior Vice President wrote. The outlook is widely shared by other experts, including CRU analyst Hamish Sampson. 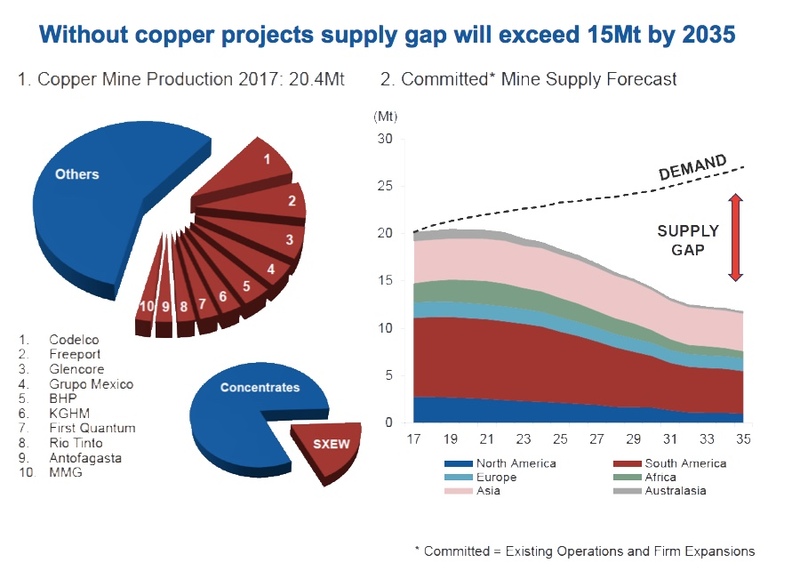 According to him, unless new investments arise, existing copper mine production will drop from 20 million tonnes to below 12 million tonnes by 2034, leading to a supply shortfall of more than 15 million tonnes. The situation looks even worse when considering that over 200 copper mines currently in operations will reach the end of their productive life before 2035, Sampson said last month. Only if every single copper project currently in development or being studied for feasibility is brought online before then, including most discoveries that have not yet reached the evaluation stage, the market could meet projected demand, the consultant noted. Political risk is also weighing on the projected deficit of copper and almost every other so-called “battery metal,” except for lithium (so far, but there are mountain concerns). Only in the past week, the Democratic Republic of Congo’s state-owned mining company began legal proceedings to dissolve its Kamoto copper and cobalt joint venture with Glencore. The government of Indonesia, in turn, imposed new environmental standards on the giant Grasberg copper and gold mine owned by Freeport-McMoRan. And negotiations at BHP’s Escondida, the world’s largest copper mine in Chile, have yet to be settled. 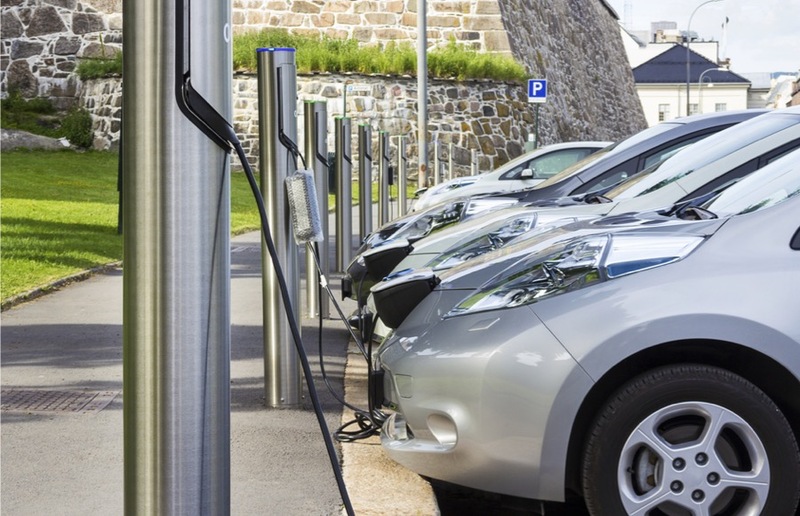 Moody’s analysts say demand for battery metals is expected to increase even further as a network of charging stations for electric vehicles (EVs) is built out. According to them, battery electric vehicle’s (BEV) share of new car sales will rise to approximately 7% to 8% by the mid-2020's and reach nearly 17% to 19% by the end of the decade. Graph courtesy of Moody’s Investor Service. 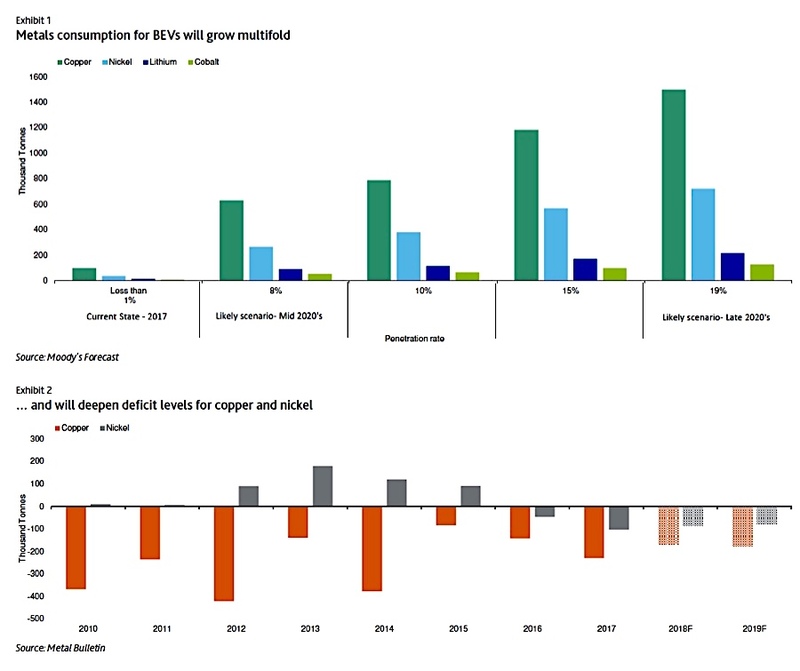 The rating agency predicts that copper consumption in BEVs may increase more than six times, greatly outstripping supply. Moody’s also expects nickel and cobalt supplies to be insufficient to support growing demand for battery production, becoming another constraining factor on near term BEV growth. Aware of that possible scenario, several companies are already working on finding alternatives to cobalt and lithium and also looking for them where others have not. Toyota Motor Corp, Asia’s No.1 carmaker, said last month it had found a way to make electric vehicles (EVs) more affordable and less vulnerable to shortages in supply of the key elements needed.